SmartThings began its life as a kickstarter project looking to connect the things in your physical world, to the internet. Of all the Internet of Things technologies we will review this is probably the most ambitious and the one with the most potential. So what is SmartThings? It is a hub that includes access to the most common home automation protocols and it is also a set of proprietary sensors and controllers. In our last IoT review we looked at the Harmony Smart Control which acts as a super remote control controlling almost any device that includes and infrared, radio frequency or Bluetooth remote control. 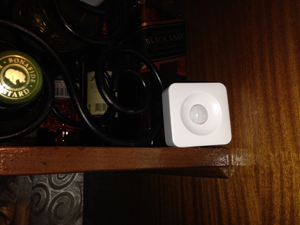 SmartThings goes a step further by controlling a whole host of other devices. Before we go any further let’s start with Home Automation 101. In order to automate things such as turning lights on and off, turning on appliances or automating responses to changes in temperature, motion or moisture you need devices that that measure these parameters and then send some sort of signal that is interpreted by a device that can be told what to do in response to the various signals it receives. The way these devices talk to one another is governed by protocols and the problem SmartThings is attempting to solve is the fact that we have so many protocols that typically do not talk to one another. You have stuff like Zigbee, Z-Wave and companies that offer their own proprietary standard, in fact a whole alphabet soup that frankly the average consumer shouldn’t have to worry about. SmartThings would like to worry about that so that you don’t have to. That sounds great so how does that work for us here in Zimbabwe? Well to test it out we got our hands on the SmartThings Smart Home Starter Kit which includes a Hub (hint: we will be seeing a lot more hubs before this series is through) a motion sensor, an open and closed sensor, and a presence sensor. There are a number of other devices available such as smoke detectors, flood sensors, sirens and alarms. To set it up we simply connected the hub to our network via Ethernet. We then fired up the included app and then began adding the various sensors. We placed the motion sensor in the living room, the open and closed sensor on the front door and added the phones of various family members as presence sensors. We found that the sensors worked very well with the hub and the app would quickly notify us when the door was opened or motion was detected. We also were quickly notified when a family member came home. We were able to set up routines such as having a camera take a photo if motion is detected in the lounge after 10:00 PM or set it to turn on a smart security light (which we will review later) when a particular family member got home. The SmartThings system is compatible with a number of other solutions so for example you can connect SmartThings to your Harmony remote setup and configure is such that when SmartThings detects your return it automatically turns on the TV and sets it to your favourite channel. The biggest challenge we had was related to the internet. As mentioned in the first article on IoT, we are testing using a UMAX Wimax connection. One of the peculiarities of this connection however is that whenever the power goes you need to log in to a web portal to reconnect. We reached out to UMAX and there is a solution they are working on to resolve this issue and we will update once it has been implemented. Aside from that we were pleased with how the solution worked over all and we can see a lot of potential for this type of technology. What has been your experience with this IoT device? Is there an alternative that you prefer in the market? That may become a reality sooner than you think. With iOS 8 Apple unveiled home kit which should allow you to control caprine devices using voice commands through Siri for example “Goodnight Siri” could turn off various devices and arm the alarm. Furthermore Smartthings was recently bought by Samsung so expect interesting developments there as well.